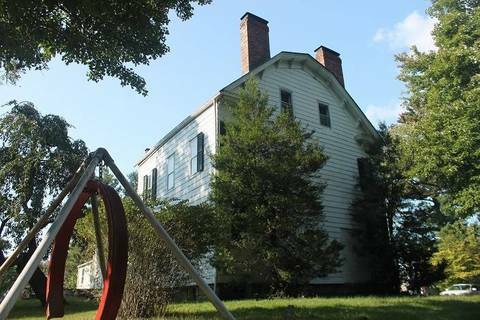 Built in 1745, the architecture of this historic house reflects the daily lives of the early settlers. Thomas Force, its first occupant, and his wife Hannah Smith settled in the house and became the parents of ten children. Over the years, he added a larger section to the one-room house. Thomas Force, born in Woodbridge in 1758, was an early settler in the area, a veteran of the American Revolution, active in local affairs and one of the original township officials. He served in the Revolutionary War as a Corporal in Captain Henry Squire’s Company, the Second New Jersey Regiment, Essex County Troops; was a prisoner on the British prison ship Jersey; and was present at the winter encampment of American Troops at Valley Forge in between 1777 and 1778. He married Hannah Smith around 1780-1782 and was probably given the farmstead at that time. In addition to operating his farm and sawmill, Force was associated with the local and religious affairs of the Canoe Brook area during his lifetime. In 1782, along with other early settlers, he helped erect the first school house in the area, a crude stone building at Northfield Center. In 1786, Force was one of the original members who formed the Canoe Brook Baptist Society. One of the earliest meetings of this society was held in the Force home this same year. Force was a member of this church for more than 41 years and a Deacon for almost 40 years, carrying on the society’s work. In 1800, when the Baptist Society incorporated as the Northfield Baptist Church, Deacon Thomas Force gave woodland timbers and sawed some of the lumber for the construction of the first church building at Northfield Center. He also served as an Overseer of the Highway in 1787 and 1790, according to records of the Township of Newark. Force built the two-and-a-half-story frame addition around this time. When the state legislature granted a charter for the formation of the Township of Livingston in 1813, Thomas Force was chosen as one of the original town officers, again serving as Overseer of the Highway. He died in 1827 and is buried in the Northfield Baptist Cemetery. Thomas Force, by his will dated 10 April 1827, directed his executor, William B. Force, to sell “the land deeded to me by my father” if necessary to cover the debts and legacies. Accordingly, 12 years later, the executor and his wife, Livingston resident Martha Ann, conveyed the three tracts “with all and singular the houses, buildings” by deed to John Emmons of New York City for $5,000. Some eight other families owned the property before the Township of Livingston purchased the Force Home in 1962.The inside of the house was badly in need of repair and the entire house had to be shored up. It became the purpose of the newly formed Livingston Historical Society to restore the Force Home. Members of the society located and preserved numerous items of historical significance which are now on display: a grandfather’s clock from the Edison Foundation, an original Hitchcock rocking bench, many Victorian pieces, spinning wheels, a large mirrored clothes rack that belonged to General McClellan, and a large original desk, used in Livingston’s first Post Office. In the front of the building is an old Indian stone, used to grind corn. Docents from the Livingston Historical Society lead free tours of the Force Homestead, usually on the second Sunday of the month during September, October, November, April, May and June from 2 p.m. to 4 p.m. In addition, private tours may be arranged by contacting Lorraine Palmer at 973-992-6896.